The insulation properties of an EncapSulite® PolarGuard® Jacketed lamp permits the use of fluorescent lamps in low temperature areas and freezer lighting applications without causing lumen depreciation. Not for use in applications above 10°C (50°F). 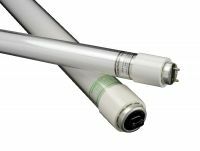 EncapSulite® Jacketed Fluorescent Lamps are designed to provide maximum safety protection and containment of glass, phosphors and mercury within the thick wall shatter resistant jacket. EncapSulite® Safety Jacketed Fluorescent Freezer Lamps are in compliance and meet current FDA, USDA and OSHA standards. Patent pending. Typical applications for PolarGuard® Jacketed Lamps: Freezer lights and Low Temperature Food Display Cases. EncapSulite® is committed to providing you with SOLUTIONS to your safety and shatter resistant commercial lighting requirements. EncapSulite® products are problem solvers. You can be assured that EncapSulite® will guarantee you fast, accurate delivery of your EncapSulite® shatter resistant safety coated fluorescent freezer lighting lamps requirements. Contact Us or Request a Quote today to place your order.